Although Geje “Gravity” Eustaquio already knew that he was on the verge of having his hand raised in triumph, the Filipino fighter was expecting a different result on the judges’ scorecards. 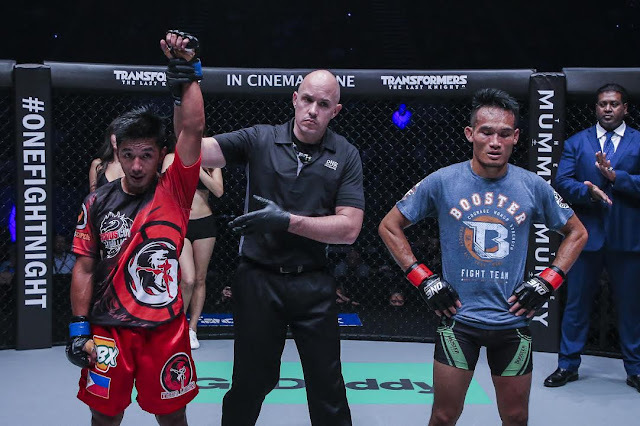 Eustaquio, who edged out Thai rival Anatpong “Mak” Bunrad on the undercard of ONE: DYNASTY OF HEROES in Singapore on Friday, May 26 via split verdict, thought that he did enough to get a unanimous decision from the three officials at cageside. “I was surprised with the three judges’ decision. I was expecting a unanimous decision win against my opponent. But I am good with it. I respect it,” he said. The 28-year-old native of Baguio City, Benguet felt that he started to dictate the pace of the three-round flyweight rematch in the second stanza, displaying superb footwork and frustrating the physically stronger Thai combatant with crisp counterpunches. “Rounds Two and Three, I knew it’s all mine because I was landing my strikes. I was consistent with that. My work rate was much better this time around as well,” he stated. Eustaquio bucked a slow start in the opening round when the rangy Bunrad came out strong in an effort to intimidate the Team Lakay representative. However, as the fight went on, Eustaquio regularly connected his leg kicks and countered Bunrad with right straights and elbows whenever the Thai charged in. Bunrad had a tough time connecting his shots in the third frame, but he did score a takedown in the dying minutes of the round when he caught Eustaquiao’s head kick. Even though he was fighting on his back, Eustaquio was able to roll his opponent and went on top of Bunrad near the final bell. When the bout’s final bell sounded, Eustaquio knew that he was walking out of the 12,000-capacity Singapore Indoor Stadium with the sweet victory. “After the third round, I was already confident that I won the fight. From my view, I got two rounds to one,” he quipped. Regardless of the judges’ decision, Eustaquio stressed that he remains delighted with the outcome of the title tilt. Now back on the winning track, Eustaquio is willing to face any fighter in ONE Championship’s flyweight roster to prove his worth as a world-class martial artist. “It’s a breath of fresh air. I am back on the winning side. Of course, this will not be the end. There will be new assignments in the future. Anyone who wants to face me next, I am ready to dance with you,” he ended.